I WENT to Buckland Abbey in the West of England to find out more about my schoolboy hero, Sir Francis Drake ... but I ended up in Whangarei. It was well worth visiting both places, actually, because Sir Francis is one of the most colourful figures from British history. At various times he was a nationalist privateer who captured billions in gold and jewels from the Spanish, captain of the second ship to sail round the world (and the first leader to actually survive the journey), effective commander of the English fleet which defeated the Spanish Armada, explorer, politician - and, by all accounts, an enthusiastic lawn bowler. The abbey where he made his home, with the aid of all that captured booty, is an elegant old building, surrounded by charming gardens, situated in a lovely slice of Devon countryside and overflowing with history. Founded in 1278, it was originally a religious centre for Cistercian monks but, after the dissolution of the monasteries by Henry VIII, it was transformed into a grand house by two of the great seamen of the Elizabethan age, initially Sir Richard Grenville and then Drake. Today it is owned by Britain's National Trust and its rooms are full of Drake memorabilia. It was in the Treasure Room, which holds Drake's Drum, his favourite silver cup and some of the flags flown on his round-the-world voyage, that I was first pointed in the direction of Whangarei. "Oh, you're from New Zealand," said one of the volunteer guides. "Do you know of the New Zealand connection?" No, I didn't. "Well, it's rather an interesting story. But it's probably better if we get Alan Gray to tell you, because he knows all the details." Alan turned out to be in the Drake Room next door, amid some old oak furniture - not Drake's, but thought to be similar - and a collection of pictures from Elizabethan times. When I mentioned New Zealand, his face lit up. He produced a folder of information and sat down to explain that Sir Francis and many of his heirs - most of whom were also called Francis - died childless and so several times down the generations the estate passed to nephews. In 1870, Buckland Abbey was inherited by yet another nephew called Francis, who in 1861 had married an Elizabeth Douglas from Glenbervie, these days a suburb of Whangarei. Which, of course, takes us to New Zealand. Their only surviving daughter, also Elizabeth, married a Lord Seaton, who thereafter received special royal assent to inherit Sir Francis' baronetcy and add Drake to his name, and they lived together in Buckland Abbey until her death in 1937. Not long after that the house was damaged by fire and bought by a local landowner, who presented it to the National Trust. But, Alan added: "When Lady Seaton died much of her personal memorabilia went to New Zealand, to the Douglases of Glenbervie." Aha. "We understand most of the items were later presented by the Douglases to the Whangarei Museum." When I mentioned that my youngest brother lived near Whangarei so it would be easy to visit the museum, he became even more enthusiastic. "You must see if you can track down her autograph book. 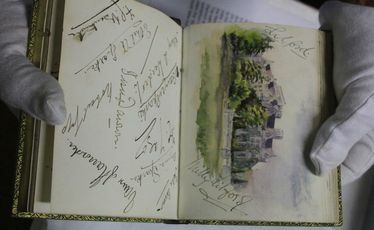 It contains small watercoloured vignettes by Lady Seaton of various country houses in Devon and Cornwall, where she attended social weekends and parties, and includes autographs of the invited guests. It's delightful. I wish we had it here." I looked up Whangarei's Drake connection on the internet. I couldn't find any mention of Lady Seaton's memorabilia. But there was a report of items given to the museum by the EJ Drake estate, including a toothpick and small spoon "reputedly used at a dinner reception for Sir Francis Drake by Queen Elizabeth I. These items were presented to Drake and have been handed down through the generations of the Drake family". Back at Buckland Abbey, Alan was emphatically dismissive of this story. "The other items held by the museum [silver spoon, watchchain and toothpick] come from EJ Drake, known as Ted, and have absolutely no connection with our Devonian Drake." So off I went to Whangarei to check for myself. The Whangarei Museum is part of an impressive complex set in a 25ha park which also includes an excellent kiwi house, a historic village, the Whangarei Native Bird Recovery Centre, a miniature railway, a new medical museum and an observatory. The museum itself has a fine display of Maori taonga and memorabilia from early settlers. But I was directed into the dungeons where the collections are held, and there to meet me was curator-researcher Mim Ringer, registrar Natalie Brookland and ... the Drake items. After putting on some gloves I first checked out the autograph book, which did indeed contain watercolours of grand houses and signatures of grand people. Next, I was able to examine a spectacular red satin dress said to have been worn by Lady Seaton at a reception when she was presented to the Governor of New Zealand in Wellington in 1880. Finally there was the collection of small silver items from the EJ Drake Estate, including the spoon and toothpick. When I mentioned the doubt about their links to Sir Francis, Natalie said cautiously that the museum "can only record what we're told by donors", while Mim added that she "always had a few doubts because they don't look Elizabethan". Still, it was exciting to examine these indirect links with my swashbuckling hero of yesteryear. Almost as exciting as exploring his home and seeing the drum with which he called his men to battle against the Spanish Armada (well, maybe, because Alan warned it might not be the particular drum used on that occasion).